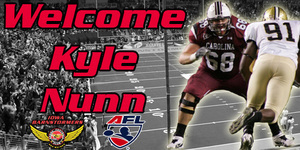 DES MOINES – Iowa Barnstormers Head Coach and Director of Football Operations Mike Hohensee announced late Thursday that the team has been assigned Offensive Lineman Kyle Nunn on a one-year contract. He becomes the eighth player assigned to the Barnstormers roster for the 2013 season. Nunn (6-6, 300) joins the Barnstormers after spending time with the New York Jets in their rookie mini-camp. Prior to that he spent 5 seasons at the University of South Carolina (2007-11), where he played for Steve Spurrier. After redshirting his freshman year, Nunn made over 20 career starts at Offensive Tackle. More importantly he was part of a unit that led the Gamecocks to back to back 10 win seasons in 2010 and 2011. Nunn was also a key player in South Carolina’s Capital One Bowl victory following his senior season. “Kyle will be a great addition to our offensive line”, stated Hohensee. “Not only is he big, but he can move fast. He’s also overcome a lot of adversity in his life which has made him strong mentally as well.” Nunn is among a group of 35 players who will be invited to the Barnstormers training camp this spring. Season tickets for the 2013 Iowa Barnstormers season remain on sale now for as little as $99.00 per seat. Don’t miss a minute of the action this season! To order your seats today, call the Barnstormers at (515) 633-2255. For additional information, log onto www.theiowabarnstormers.com.